In November, we had the privilege of having a staff developer from Columbia Teachers College Reading & Writing Project come to our school. Annie, the staff developer, worked with our grade level team for a week. She also was in my classroom as I got to be the labsite, which I was super excited and nervous about. Annie did demo lessons three times during the week. The first lesson was a preassessment on nonfiction reading. I learned some great tips and strategies. She shared with us to maximize the time during an assessment by taking informal notes on the students WHILE they take the asssessment. There were a lot of observations I could quickly make and jot down while walking around. We had two different level text sets that we gave to students. 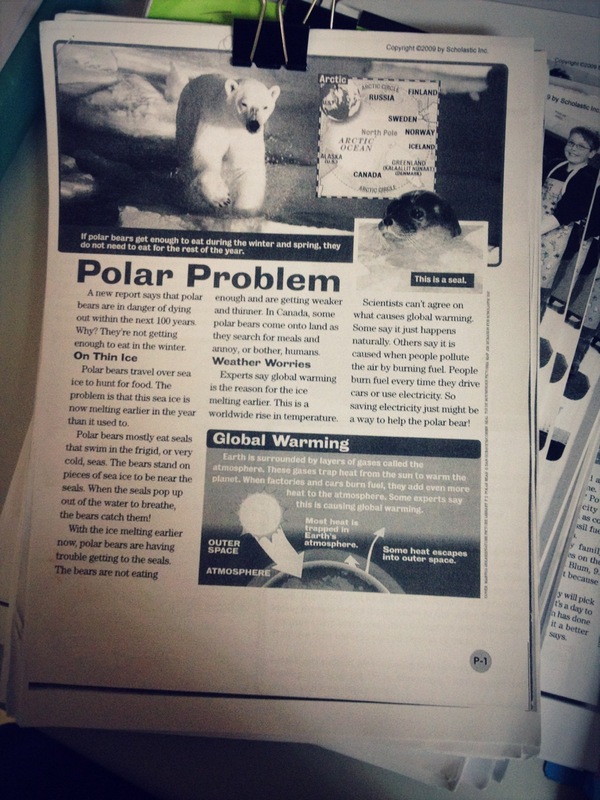 There were 2 different non-fiction articles on one topic for each text set. We had 3 questions for that the students had to answer for the text sets. When I confer with students, I always get stuck on what to compliment them during my reading conferences. Annie suggested using things that you’ve observed about them as readers in the past. I usually thought that I would have to compliment them on something I noticed them doing at that moment. However, if I can have notes on them during assessments and during their independent reading time, I could use those positive things I noticed as the compliment for the conference. One of the important take aways is to used leveled reading assessments. This is definitely a difficult task at times, but it was beneficial to give students texts that are accessible for them. That helped us gain a better understanding of their comprehension and higher level thinking skills knowing that the text was at their level. Therefore, we couldn’t say, the text was too hard for them, therefore, they couldn’t answer these questions. After we looked over and analyzed their assessments, that shifted how I decided to teach the nonfiction unit. I think often we tend to give pre assessments and then teach the unit how we always taught it. It’s critical to look at what students know and see what gaps there are. I know for my students, I noticed on the assessment that a lot of them needed explicit teaching on nonfiction text structures and comparing two texts. Therefore, I shifted my original mini-lessons in order to focus more on those two areas. Stay tuned for Part 2, in which I’ll discuss good read alouds, mentor texts and some more tips! Awesome to get to have her in your room. I’ll be waiting for part two. Thanks Kristi!!! I’ll be working on writing up part 2 soon~! I feel like I just got smacked with a “duh” moment. I have never though of observing students while they are doing actual assessments! That makes so. much. sense. Awesome to hear about this non-fiction unit. Love your conferring ideas. So helpful, Jee Young!! I am elbow-deep in one myself with my 7th graders. I am really working on annotating with F/Q/R charts (Facts, Questions, Responses) to check for understanding, but also troll for good inquiry questions. Once students have been able to identify text structure, we have been using graphic organizers that fit the text structure.